Another Monday, and with it another WhereArtI quiz to tickle your head. 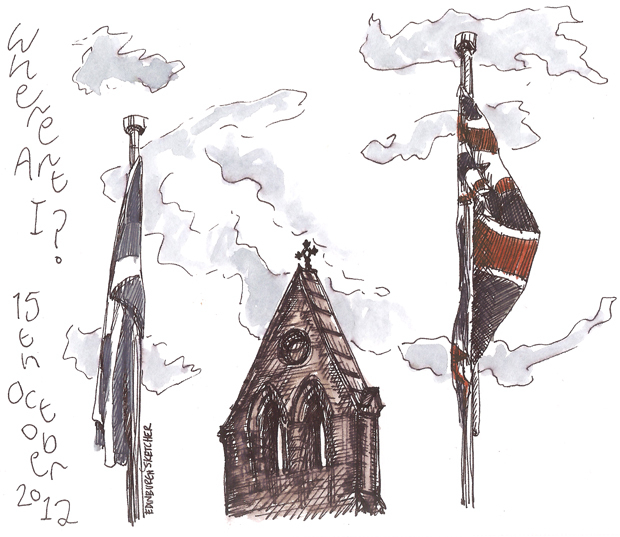 Can you name this building, the top of which is seen here between a couple of flags? If you can then shout it from the rooftops… or tweet/facebook/message me instead. Clues to come for those who need them, keep checking on facebook and twitter. Remember to include the hashtag #wherearti with your answers either below, on facebook or twitter and also to keep an eye on the ES facebook page for clues throughout the day. Answers to come by this time tomorrow, and although for now the quiz is just for fun the first three correct answers will get a mention plus a link from my site if they make it onto the WhereArtI leaderboard. For the time being WhereArtI? is just for fun, but if you would like your business to appear in the sketch, sponsor the quiz or supply a prize then please get in touch. Well done to all those who correctly identified the building between these two flags as The Queens Gallery at the Palace of Holyroodhouse. Opened by Her Majesty The Queen on 29 November 2002, as part of the Golden Jubilee celebrations, the gallery was built in the shell of the former Holyrood Free Church and Duchess of Gordon’s School at the entrance to the Palace of Holyroodhouse. For more information about the gallery and current exhibitions visit the website HERE. This weeks leaderboard points go to: @Grant___ (3pts) @l_eardley (2pts) @crgn (1pt). More #WhereArtI fun next Monday. Have a good week!